Home » Uncategorized » Club Carlson: Rewards and a giveaway! Club Carlson: Rewards and a giveaway! There’s no doubt about it, travel is not cheap! A few years ago, a bunch of businesses popped up to help cut costs on accommodations, offering hotel rooms at discount prices. But are those third-party sites always the best way to save? The answer — Not anymore! Club Carlson, the global rewards program for the Carlson Rezidor Hotel Group which includes Radisson Hotels, Country Inns & Suites By Carlson and others, has announced a Members Only Rate Exclusive to ensure that its repeat guests get the best rate possible. Members who join Club Carlson and book directly through brand websites and apps (Carlson, Radisson, and other member hotels) receive the best rates PLUS 10% savings. No more guessing on where the best rate will be! Their program saves members both time (no more searching the web) and money! Isn’t that what brand loyalty should be about? 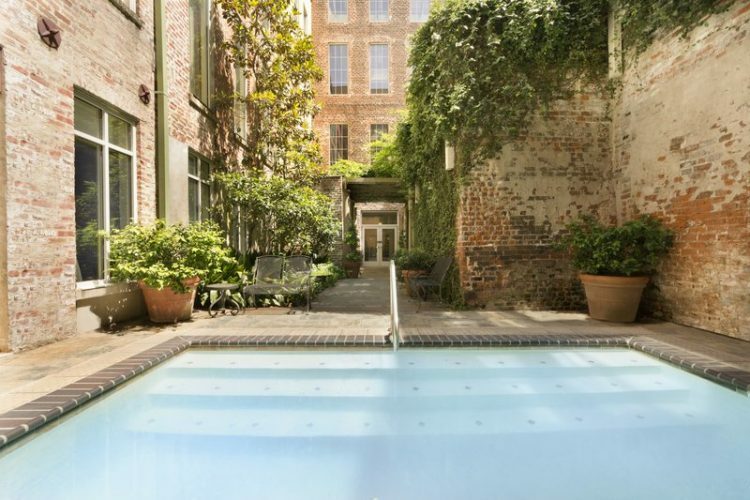 First, I want to stay in the French Quarter — in the heart of the city! So, I chose Country Inns & Suites by Carlson, French Quarter. Rooms include some great amenities like free hot breakfast daily, 14′ tall windows for stunning views and plush bedding — plus all the other extras we have come to expect: wifi, cable, fridge and microwave for snacking! A king room — look at those windows! 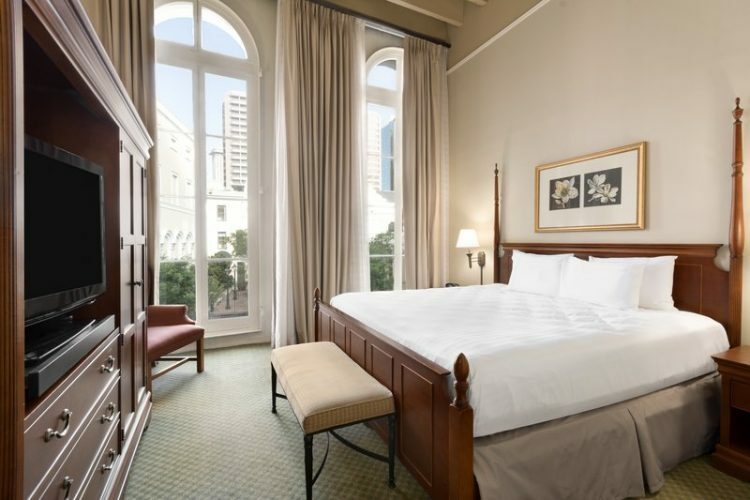 The standard rate for an Executive Room for a 3-night weekend in October averages $272.33/night. With the Club Carlson Member Rate for is $219.91! That’s a savings of about 20%. On third party sites, the best rate I found was $226, so the member rate is lowest. For the budget-minded traveler (like me), you can also look at it as an additional $52.42 per day to spend on things like food! That’s a lot of beignets! 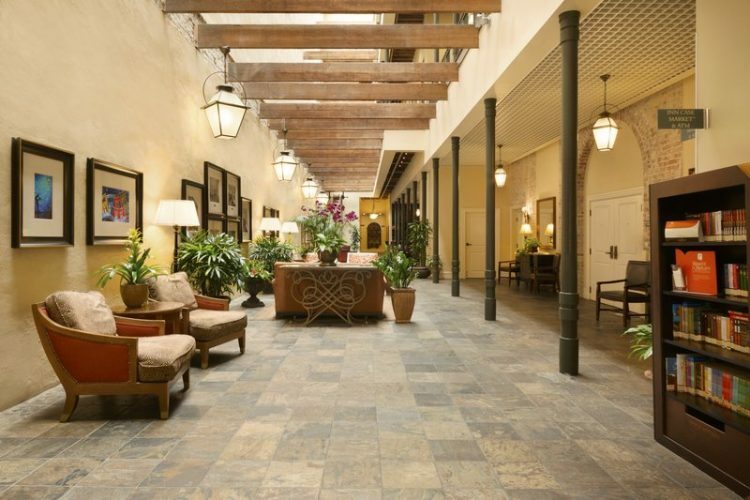 The hotel’s interior mimics the architecture of New Orleans, making a stay here feel special. The pool, too, is surrounded by aged brick walls. And, this Country Inns & Suites by Carlton Hotel includes available bike rentals! Can you imagine biking through NOLA in the fall? What a fun way to explore! 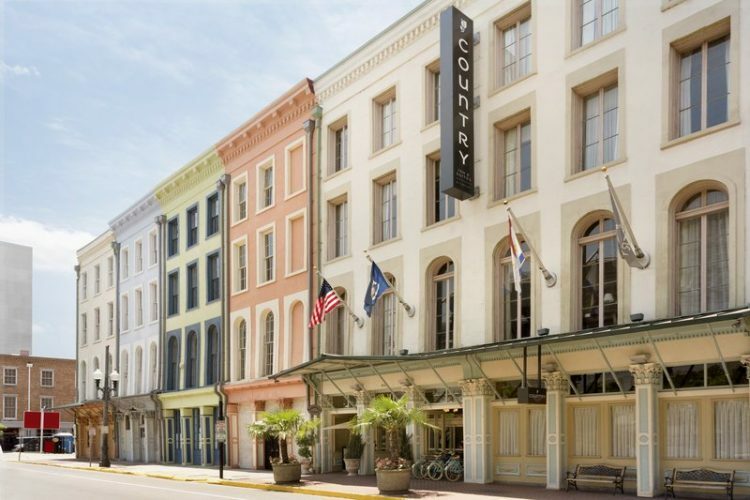 Because Club Carlson Members save more on rooms, it means that guests can consider hotels like the Country Inns & Suites by Carlson, French Quarter in the heart of the action instead of staying further out and driving into the city each day. a 10 minute walk from the National World War II Museum. With so much nearby, there’s no need to drive! Just park the car and explore NOLA on foot, by bike or by streetcar. Another benefit Club Carlson Members get is free stays with as few as 9,000 points. And I have great news! I’ve partnered with Club Carlson to give one lucky reader 30,000 points for free. 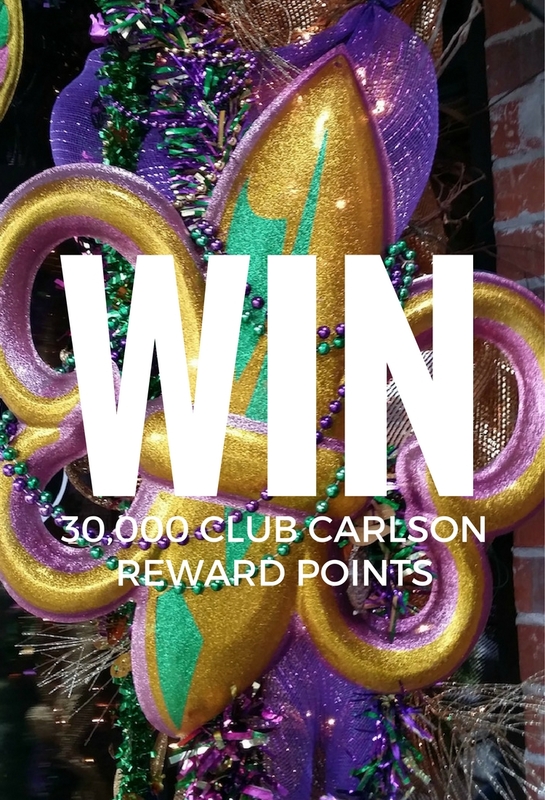 You will have to join Club Carlson to win — they need someplace to deposit those points after all. This is an easy giveaway for blog readers only! Click on this link which takes you to the Carlson Hotels booking site. Once there, pick a city that begins with the same letter as your first name and find a specific Carlson hotel there. Then leave a comment here (at the bottom of this post) and tell me the specific name of the hotel. Be sure you include a valid email address when you sign in so I can contact you if you win. I will not use the email for any other purpose! Special thanks to Club Carlson for sponsoring this post and giveaway. Hotel photos used with permission. Austin, TX. And I wouldn’t even mind going there! I found the Radisdon Hotel Sudbury Ontario, Canada! I found the Radisson Hotel Albany in Albany, New York! Thanks for the chance at an AWESOME GIVEAWAY! I learned something today….there is a city in New York called “Jamaica”. There is a Country Inn & Suites located near Jamaica in Queens, New York. Near Manhattan and close to the train station, perfect location…. Edgefield is found in South Carolina. The Country Inn & Suites in Aiken, South Carolina was the closest location. Internet and a hot breakfast….perfect setup for a college student that is travelling! When I entered Kiawah Island, South Carolina, the Country Inn and Suites in North Charleston came up. Looks like a great location and includes a heated pool…very nice. Ok, this could have been a challenge with a “V” name….but I met the challenge!! In Valdosta, Georgia I located the Country Inn & Suites. An indoor pool, a hot tub and a free hot breakfast….can’t go wrong with this one! I would love to visit the Radisson Suites in Tucson, Arizona. The scenery looks amazing! Country Inn & Suites By Carlson, Wolfchase-Memphis, TN. I’d to visit Louisiana, so I selected Radisson Hotel Baton Rouge! I choose Athens, Greece at the RADISSON BLU PARK HOTEL, ATHENS. That would be amazing! ???? Wow, what a great giveaway – and rewards program. I am always loyal to companies with good programs like this. I’m such a fan of hotel and travel rewards programs. I have never stayed at a Country Inn & Suites before. Looks like there are some great ones in Atlanta. Will keep in mind for my next visit. Too many “David” destinations to choose from. I think I would go to Dublin, Irelend, because I am of part Irish ancestry, like most people. Plus, maybe I could find a leprechaun and get wishes, or gold, or whatever leprechauns have. That’s GORGEOUS. I visited the French Quarter years ago, but I didn’t stay in anything as lovely as this. Country Inn & Suites By Carlson pretty awesome. Now I cross finger and pray I win as mama needs a vacation. You can reach me at RebeccaBryant562@gmail.com when i win. First, staying in the French Quarter is awesome. And I choose Country Inn and Suites in Atlanta. As much as I wanted to choose Austria, Atlanta was more practical. ???? Going for extra credit? 🙂 Good luck! Seattle: Radisson Hotel Seattle Airport. Looks nice! Country inn & Suites at Dallas Love Field was my choice. I don’t necessarily want to go there, but it’s the first “D” city I could think of 🙂 I DO want to go to Austin, TX! I picked the Country Inn and Suites in Scottsdale, AZ (since they didn’t have one in Tempe). HAHA!!!! That’s a good choice. Tempe is one of my favorite cities! Their waterfront is perfect for adventurous families and the downtown is adorable. Lots of posts about Tempe here on the site if you need further inspiration! I’d like to go to the Park Inn by Radisson at the Shannon airport in Ireland, please. Amsterdam has to be the city. Perfect holiday spot. Art’otel Amsterdam by Park Plaza looks absolutely wow. A trip to Europe usually involves hopping multiple cities, but if it was the above hotel in the above city, I’d gladly spend my week long holiday there. I went for a fun one, Radisson Blu Hotel Milan. Trip to Italy would be great. The best part is it is by Tanger Outlets and Premium Outlets!! whoohoooo! Signed up for the club also. Awesome giveaway! Thanks for entering. 🙂 I live only 15 minutes from a Premium Outlets, so I know how fun the shopping can be! IWe love to visit family in Charleston SC. Found a Country Inn & Suites in North Charleston. I found Radisson Hotel Colorado Springs Airport. Radisson Blu Hotel Johannesburg ZA ???? If you win, can I go with you? Radisson Blue Style, Austria Vienna. I chose Louisville, Ky’s Country Inn & Suites by Carlson, Louisville East. I chose, Radisson Blu Gautrain Hotel, Sandton, Johannesburg ! Sounds like a fun place to check out! I chose the Radisson Hotel El Paso Airport in El Paso, Texas because it is in my home state of TX! Radisson Blu Waterfront Hotel in Jersey – Channel Islands ???? I found a Country Inn and Suites in Chicago! That sounds like a great place to get away!